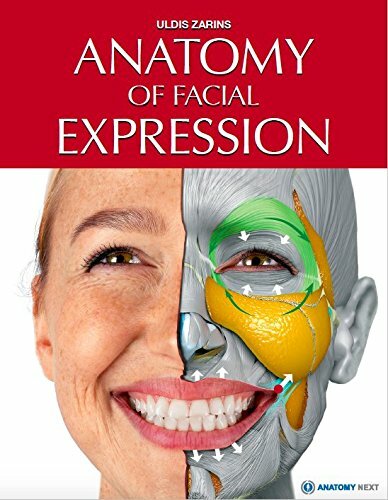 Here's another incredible book by Uldis Zarins for those who want to expand their knowledge of anatomy, more specifically to learn more about facial expressions. The earlier book was called Anatomy for Sculptors: Understanding the Human Figure, which is also a terrific resource on anatomy. What's so special about the book is it uses 3D renders of muscles overlaid onto photographs in an attempt to show you the muscle structure more clearly. This presentation style works very well. There are pictures of actual people, the 3D skull structure and muscles overlays, side by side comparisons with 3D renders, and also photos overlaid with the 3D renders. All the muscle groups are carefully differentiated from one another and labeled. The text also explains how muscles work, and there are little arrows that show you how they move. For example, it also explains why aging people have protruding chins and shows you the structure of their head. The quality of the 3D models and renders is excellent, in high resolution and clarity. The amount of effort put into creating these 3D models, and producing the book is evident. The second half of the book features photographs of models in different facial expressions. Selected models have 3D muscle overlays. The other highlight of the book is the use of augmented reality to present a 3D model that you can move around to view different angles. This is a really cool concept. It's like walking around an actual human model or anatomy model. You can download the app at Anatomynext.com, and use the apps to view the 3D models that were created in this book. Here's the bad part. The official retail price of the book is USD 99. That's quite pricey for a 222 page paperback book. It's a great book and has a price to match. The information in it is excellent though so in the end, it might still be worth the money.